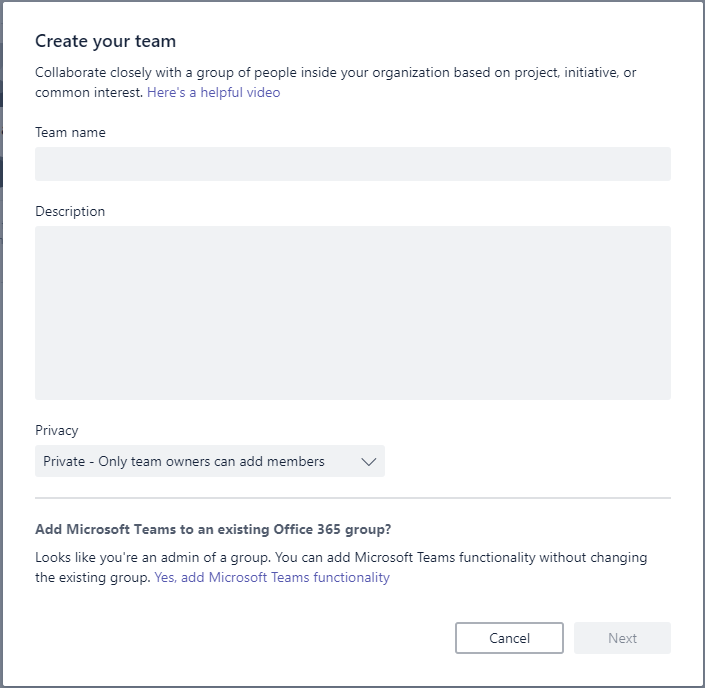 Home › Office 365 › Microsoft Teams › Microsoft Teams – How to create a Team when you can’t create Office 365 groups? Microsoft Teams – How to create a Team when you can’t create Office 365 groups? Within Microsoft Teams it is possible to create new teams if you have sufficient permissions to create a new Office 365 Group. However, what happens if you don’t have enough permissions to create a group? What if you want to c reate a team and use an existing group? Currently you can see the Add team option even if you don’t have permissions to create a group. This is probably ok, as you might just want to create a new team for an existing Office 365 group. When you click on the option to Add a team you will find another Create a team button if you have permissions to create an Office 365 group. Huh, what if I want to create a new team for an existing Office 365 group? I don’t need permissions to create an Office 365 group for that! Just to go a bit further, in the dialog to supply the team name there is a link to add a Team to an existing Office 365 group. Then just why is it not possible to do this if I don’t have permissions to create a new Office 365 group?